The customer, the product designer, and the roll designer must agree on the interpretation of dimensions and tolerances specified in the drawings before roll design commences. Product tolerances will affect the roll design, the number of stands, and thus the tooling costs. As a general rule, the tighter the product tolerances, the greater the number of roll forming stands. The infinite variety of cross sections and tolerance combinations make it impossible to put an exact numerical value on the increased number of passes required, but experienced roll designers have a feel of how many extra stands to achieve the required tolerances. The nature of roll forming will cause camber, bow, twist, cross-bow, herringbone effects, edge, or center waviness. as well as imperfections in material, equipment and setup. Tooling has great influence on residual stresses, which create deviation from straightness and flatness. Good roll forming machine design eliminates or minimizes them, while bad design creates or exaggerates these problems. The roll forming machine designer must dictate the sequence of operations if the cross-section specify the holes, notches, emboss, or other changes to the strip surface.. During roll forming process, certain parts of the product are under tension, while some others are compressed. The roll forming machine design should influence the difference between the overall length of the part before and after roll forming. In some cases, the designer can proceed with prepunching the product, using the final or estimated dimensions. Based on the hole location measurements before and after roll forming, adjustment can be made in the prepunching pattern. Sometimes, Sometimes, To establish the final prepunching dimensions, the designer have to repeated some steps. However, it is important that carry out the test with the same roll pressure. Undue large pressure can thin the material and elongate the product, thus giving false test results on the hole locations. The length measuring method, the die accelerating system and the press have the greatest influence on length tolerance. 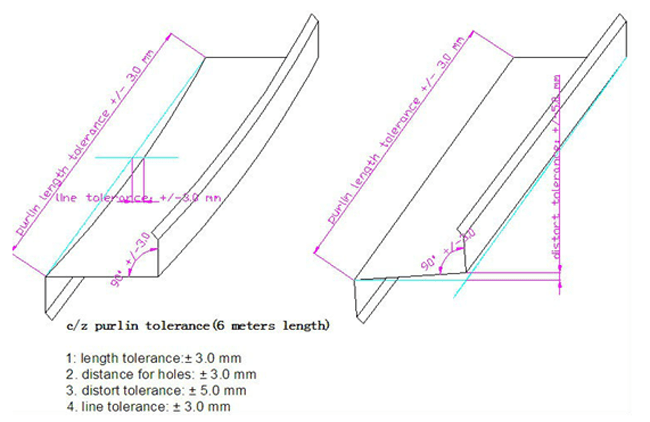 In additional, other factors such as roll design can also influence length tolerance. The surface speed differential at the driving surfaces can cause uneven roll forming speed. A large difference between the driven top and driven bottom roller surface speeds can increase the length tolerance by 8 to 10 times.